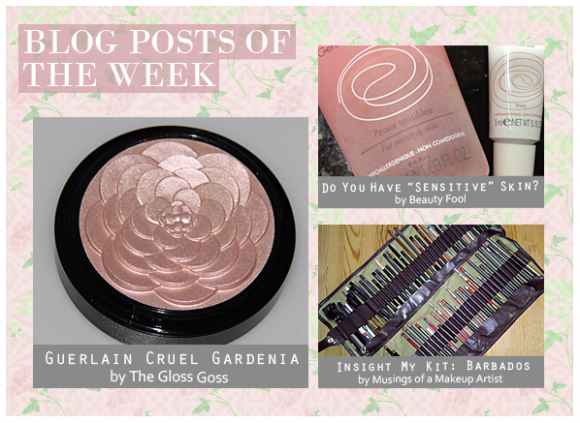 The upcoming Cruel Gardenia Shimmering Powder from Guerlain is swatched and compared to the latest release from Laura Mercier in this picture perfect post. Tali describes the texture and finish of the powder wonderfully. So many women believe that their skin is sensitive and end up treating it with products that are not suitable for their unique skincare concerns. Renee’s information post about skin self-diagnosis is an eye opener! This little peek into Kenneth’s makeup collection is pure indulgence. His work trip to Barbados had him stuffing a selection of his kit into his luggage, and the result is this wonderful post jam packed full of storage ideas and essential products. This entry was posted on Friday, January 27th, 2012 at 8:00 am and is filed under Blog Posts of the Week. You can follow any responses to this entry through the RSS 2.0 feed. You can skip to the end and leave a response. Pinging is currently not allowed.